The common names for the half hardy bulb Amaryllis include Belladonna Lily and Naked ladies. They typically flower from late summer to autumn. Amaryllis grow stems up to 50 cm in height. Naked ladies have beautiful trumpet shaped flowers, and they make ideal pot plants. Amaryllis photographs by NatalieMaynor and Digital Cat. Common Names: Belladonna Lily, Jersey Lily, Naked ladies, Amarillo, March Lily, Easter Lily. Life Cycle: Hardy perennial. Bulb. Height: 20 to 24 inches (50—60 cm). Flowers: Late summer through to autumn. Foliage: Produced in autumn or late spring (warmer areas). Green. Strapped shape. 12 to 20 inches (30—50 cm) long, 1 inch (2.5—3 cm) wide. Seeds: Cover seed. Following the last frost. Space at 10 to 12 inches (25—30 cm). Bulbs: plant in soil amended with peat moss, compost or other organic material. Bulbs are tear shaped, plant about 4 inches (10 cm) deep with the tip at soil level. Space at about 12 inches (30 cm) apart. Water well to bed in. Then add an inch (2.5 cm) of mulch. Sow Inside: Germination time: three weeks to four months. Individual pots. Temperature: 68 to 75°F (19—24°C). Transplant outdoors following the last frost. Requirements and care: Full sunlight. Good drainage. Drought tolerant, but provide water when leaves are present, withhold water once foliage has died. Winter mulch. Provide support. Once flowers have faded cut back to one inch (2.5 cm) above the bulb. Bring Amarylli bulbs indoors over the winter in cold areas and store in a frost free, but cool place. Propagate: by dividing bulb clumps when dormant, or plant offsets when they appear. Miscellaneous: Genus contains two species Amaryllis belladonna (the more commonly grown) and Amaryllis paradisicola, do not confuse with members of the Hippeastrum genus, which are a commonly grown houseplant with the common name of Amaryllis. The name ‘naked ladies’ is derived from the fact that they flower once their foliage has died back. Has a symbiotic relationship with members of the Xylocopa genus (carpenter bees). 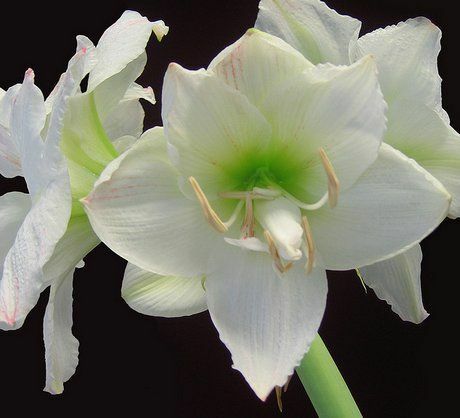 Named after the Shepherdess Amaryllis from Greek mythology. It is best to sow naked ladies on the soil surface, then just cover them with a dusting of soil. They should be planted with a spacing of 20 to 30 cm in the spring after the last frost. Amaryllis prefer sunny conditions. The soil should be rich, well drained, yet and moist. Amaryllis requires between three weeks and 16 weeks to germinate. If starting off indoors, they should be grown at 19 to 24 degrees centigrade from february in individual pots then put out doors after the last frost of spring. 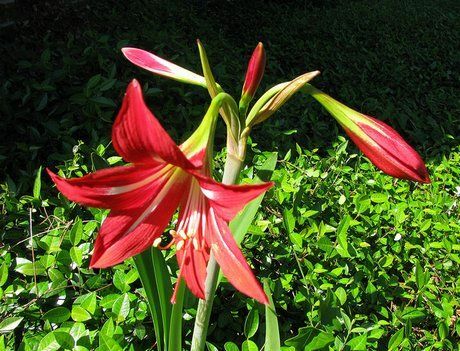 Amaryllis are not the easiest plants to grow from seed and they may take up to nine years to flower! They require a thick mulch in the winter, and bulbs should be stored indoors in severe winters.